Is Barb celebrating with White Zinfandel? Say it ain’t so! Has the menial farm labor forced her over the edge? What’s next? Hard apple cider? 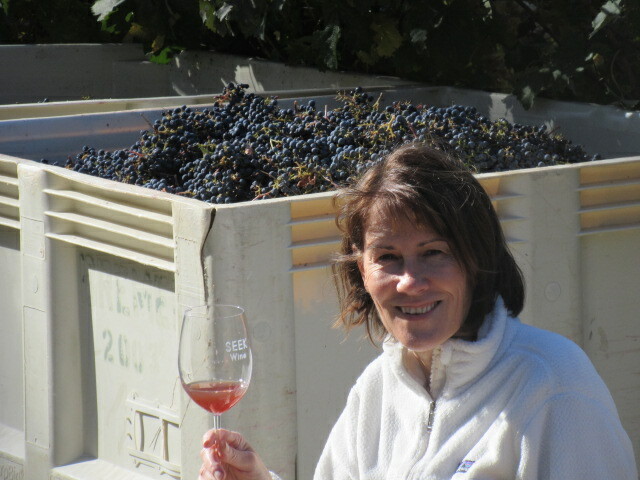 Actually she’s drinking our 2018 Cabernet Sauvignon on the day of harvest. 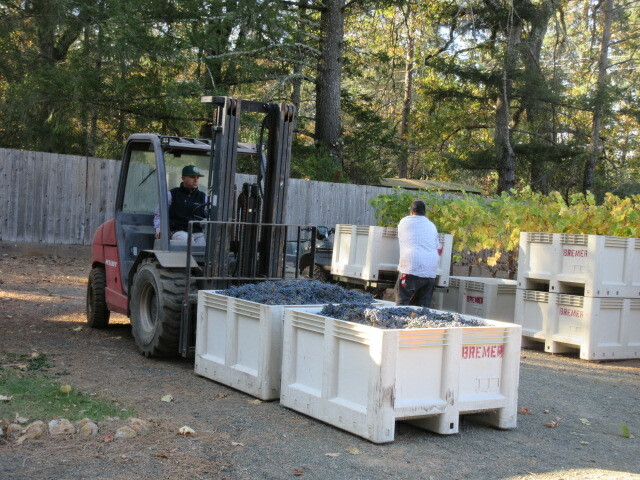 Technically it’s only grape juice, but that’s as “red” as it gets at harvest. It becomes red wine after 2-3 weeks of fermentation. During fermentation. the sugar in the grapes converts to alcohol making the grape juice wine. It becomes dark red wine because we ferment the juice with the crushed grape skins. The juice extracts color, flavor, and tannins from the skins. The longer the fermentation, the greater the extraction. Now you know how white Zinfandel and Rose’ are made. 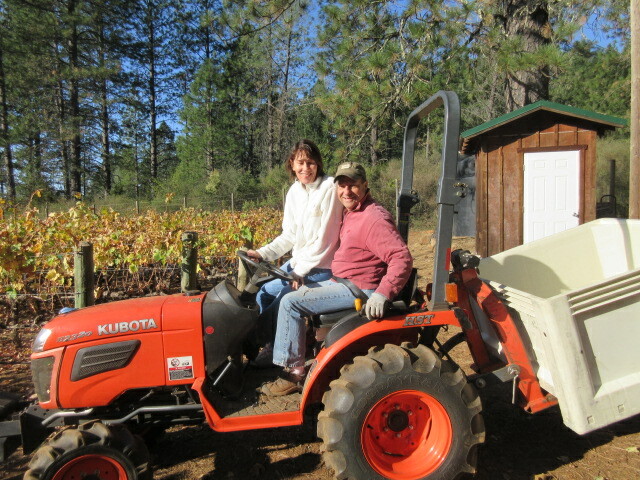 Bob (the winemaker), can we agree it’s time to harvest? These vines were once vigorous, beautiful, and proud. Now they’re humiliated? Have you no shame? 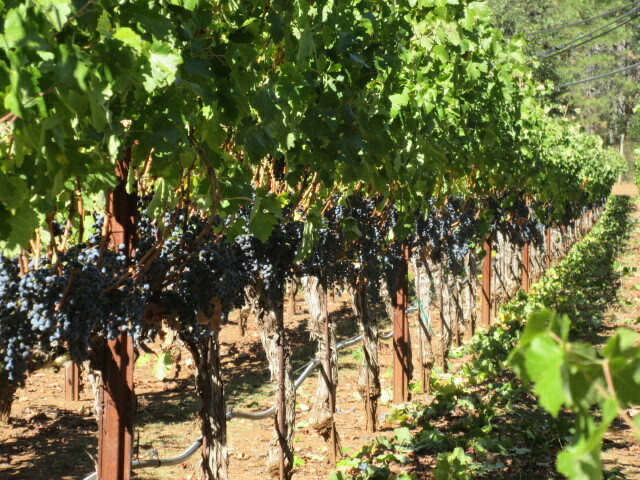 Harvest was late this year throughout Napa Valley for 2 reasons. First, veraison (when the grapes turn from green to blue), was delayed because of a cool August and a larger than average crop. 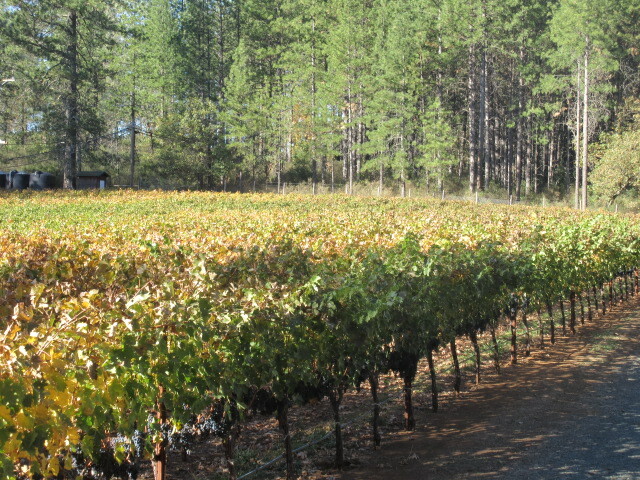 The vineyard needs more time to ripen a large crop. 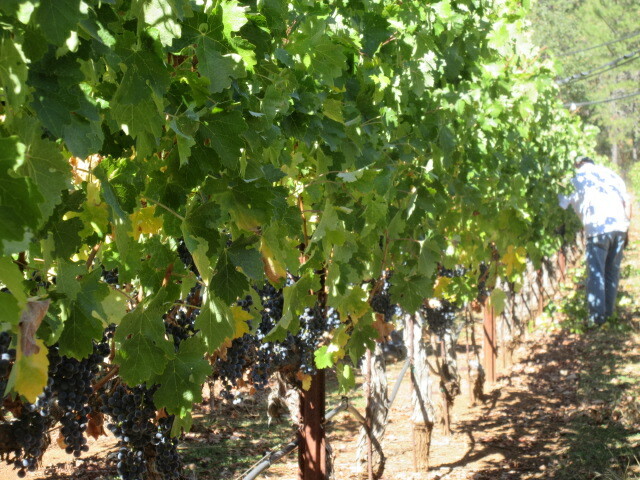 Growers throughout Napa Valley have reported yields 20-25% above average. Our harvest was in that range. Second, the October weather was the warmest we can recall in the 16 years we’ve been farming. After nearly 2” of rain the first 2 days of October, we had 29 days of sunshine and temperatures in the high 70s/ low 80s. Most winemakers let the fruit hang to improve flavor development. The early assessment is that 2018 might be the highest quality vintage in the last 10 years. The rain that fell the first 2 days of October reduced our fire risk. We’re grateful for that. 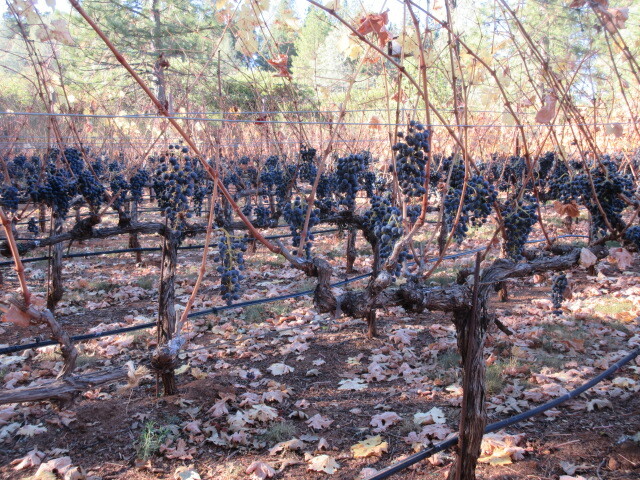 All that moisture on the fruit, the vines, and the ground can create mold, especially with cool October mornings. 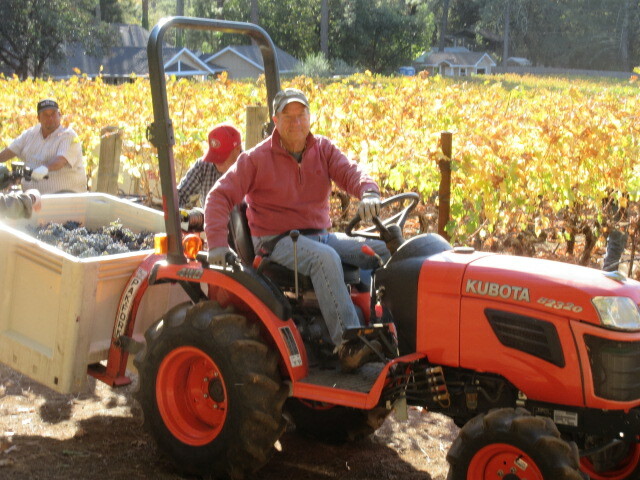 Our vineyard manager had to send the crew in to pull off the leaves around the fruit. Deleafing exposes the fruit to sun, heat, and air to prevent mold. Almost immediately after the rain, we had a few days of strong winds. That did the trick. Gerry loves harvest day because it’s the culmination of 8 months of hard work and he gets to drive his tractor for 5 hours straight. He’s as easily entertained as the average 10 year old. 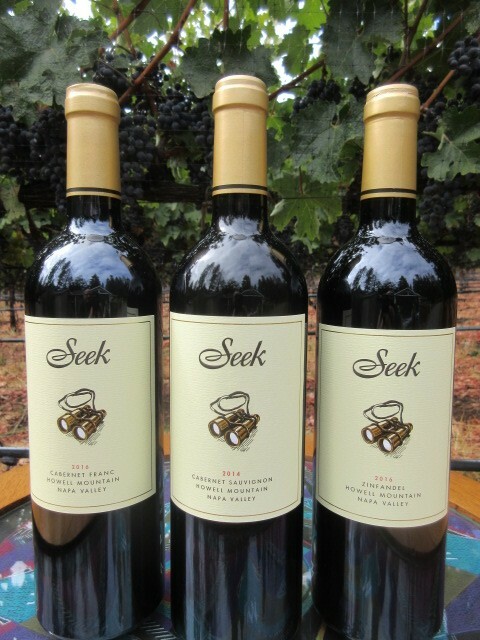 Last month we announced the release of our 3 new wines. Thank you for your very enthusiastic response. Since that announcement we developed invoice capability through PayPal. 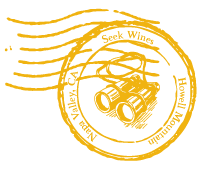 If you’ve purchased our wines before, and your contact and shipping information haven’t changed, you don’t have to go online, fill your cart, and enter contact, billing and shipping info. Simply reply to this email and tell us what you want. We’ll prepare an invoice and email it to you through PayPal. At the bottom of the invoice is a link that takes you directly to PayPal’s secure website. All you do is enter your credit card number to pay. That’s it. You may say send me a 3 bottle discounted tasting package, or a mixed case of 4 bottles of each of your 3 new wines, or a beautifully etched magnum of your pink Cabernet Sauvignon grape juice. Whatever you want. We’ll ship your wine the Monday after we receive your payment, weather permitting. Several customers have already done it. They agree it’s a much easier way to buy our wines. We are thankful for many blessings including our growing list of customers, a favorable growing season, a safe year of farming, and a bountiful harvest. We continue to pray for those affected by the ongoing wildfires and for rain. Happy Thanksgiving!